Where do the elves at the North Pole get their Christmas trees? At Old Man Winter’s Christmas Tree Farm, of course! I just finished up this piece for my plastic canvas North Pole village last week and I thought I would share how I made it. For my tree farm, I used the Mary Maxim Christmas Village Tree Farm Plastic Canvas Pattern. I recently was thrilled to discover that the Mary Maxim Christmas village patterns are the same scale as the rest of the buildings I have been creating for my North Pole village. So it is nice to have a bit more variety in patterns I can use to create my buildings. I used the pattern as it was to create the building for the tree farm, but I found the fencing to be tedious to stitch. So I decided to scrap that and use Department 56 Snow Village Fence. 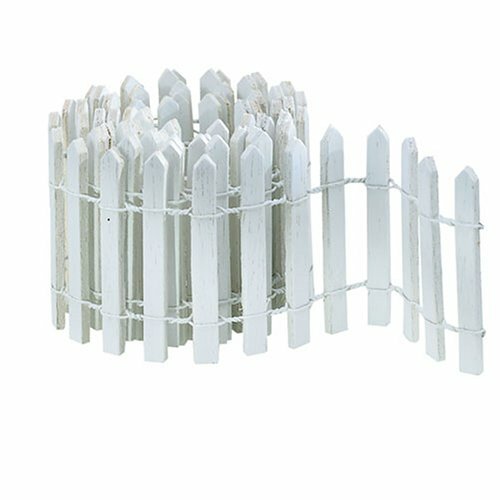 The fence comes in a roll and you get a 36 inch length. The fence is 2 inches tall, which was a bit too big for my tree farm. So my husband pushed the connecting wire up a bit and then cut off an inch from the bottom of each fence post. It’s a bit uneven, but I think that gives it a more realistic look. I just used hot glue to stick the fence down all the way around the stitched base. I decorated the fence in the front with mini wreaths from the Department 56 City Holiday Boughs set. 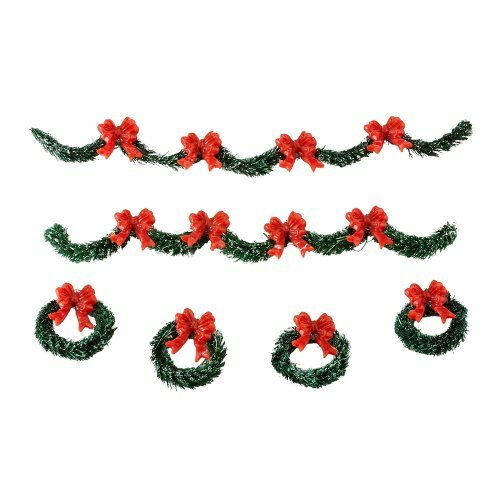 It came with 2 garland and 4 wreaths. I use all 4 wreaths on my tree farm. Three went on the front fencing and one went on the door to the building. I just hot glued them in place. I used one of the pieces of garland that came with the set on the roof line of the building. I just bent it slightly and hot glued it into place. Of course, my tree farm needed a name, so I hit up Pinterest for inspiration. I found someone selling patches for Old Man Winter’s Christmas Tree Farm and immediately decided to use that for the name. I created the sign on the computer. I wanted to do a frame for the sign, but the space was a bit small. So I just designed my sign in PicMonkey and printed it on tan colored cardstock. I am not 100% happy with it so I might change that in the future. 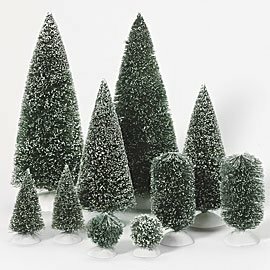 The Mary Maxim tree farm pattern includes patterns to make plastic canvas trees. However, I decided I wanted more realistic looking trees so I went with bottle brush trees. I glued eight 3-4″ bottle brush trees around the building using hot glue. For the figurine to go with my Christmas tree farm, I went with the Department 56 North Pole Village Tiny Lumberjack figurine. Isn’t he just adorable? I love his cap and little plaid shirt. And the squirrel riding on top of the cut Christmas tree is a nice touch. I really like how my Old Man Winter’s Christmas Tree Farm turned out. I am hoping to get at least two more buildings done before the end of the year. I am currently finishing up a North Pole Post Office. I have all the stitching done except for the roof and then just need to assemble it. I hope you enjoy what I have shared of my North Pole plastic canvas village so far. I have a couple more buildings to share before Christmas – the Silent Night Chapel and the Twinkle Bright Christmas Light Store. So tell me… Are you as obsessed with Christmas villages as I am? Leave me a comment below, I would love to hear from you!